Monica Maschak - mmaschak@shawmedia.com Greenhouse associate Luz Padilla works on a customer's artificial Christmas Tree to try to fix the lights in a Countryside greenhouse on Tuesday, December 11, 2012. The flower shop sells pre-lit artificial and real Christmas trees. Monica Maschak - mmaschak@shawmedia.com Designer Amanda Nicolai curls ribbons for a birthday arrangement she is designing at the Countryside Flower shop in Crystal Lake on Tuesday, December 11, 2012. 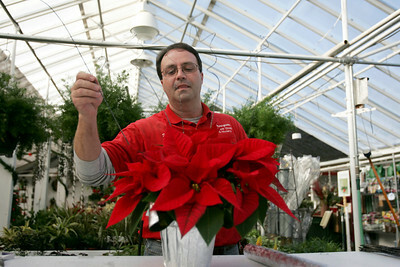 Monica Maschak - mmaschak@shawmedia.com Countryside Flower Shop Greenhouse Associate Michael Fedoran decorates poinsettias for the sales floor. 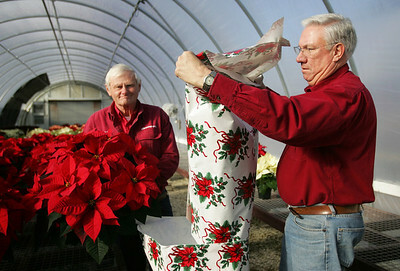 Monica Maschak - mmaschak@shawmedia.com James Riedl (left) and partner Richard Harms wrap poinsettias for delivery in their Countryside Flower Shop and Garden Center on Tuesday, December 11, 2012. The co-owners have been chamber members for 30 years.